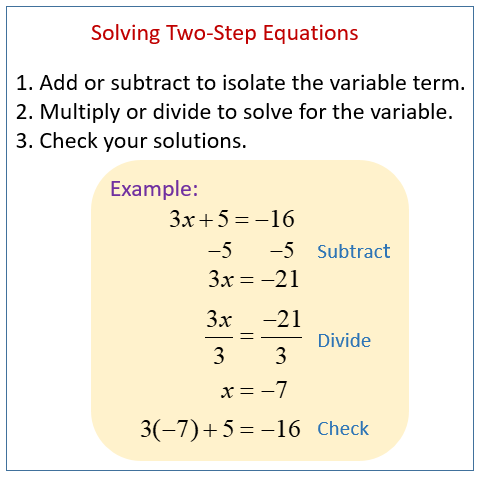 In these lessons, we will look at solving equations that require two steps. In order to solve two-step equations, we need to work backwards with regards to the order of operations. We would perform the addition & subtraction before multiplication & division. 1. Add or subtract to isolate the variable term. In the equation 3x – 2 = 16, notice that the variable is being multiplied and has a term being subtracted. To isolate the variable, we need to add 2 to both sides and then divide both sides by 3. Consider the equation, . To isolate the variable, we need to subtract 2 from both sides and then multiply both sides by 4. How to solve basic two step equations? How to solve two step linear equations with fractions? In this video, the equations are solve by working with the fraction, not be clearing the fractions from the equation. How to solve two step linear equations involving decimals? How to solve the different types of two step equations?